At the Henery Press blog, I chat about holiday traditions: taking down the Halloween decorations, looking toward the Christmas decorations, and trying not to rush past Thanksgiving in the process! Here’s a glimpse at my post. I still remember with a rush of nostalgia certain ornaments from when I was a child—a pair of tweedy elves with felt hats (one green, one red), a trio of mice each with its own musical instrument—and I loved our tradition then of keeping the tree lit up all night on Christmas eve (and yes, I realize now the electrical hazard there). This year, as our son was talking about decorating plans, I caught a glimpse of the bits that will likely stick with him: a glitter-speckled house with gumdrop lights that twinkle in time with a holiday tune, for example, or the electric Polar Express train that circles through the presents under tree. 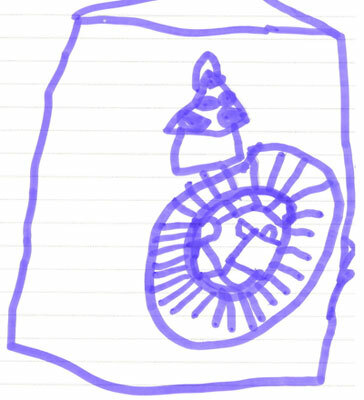 When we told him we had to wait on all that until after Thanksgiving, he drew a picture of the tree and the train instead—reveling in the anticipation since he couldn’t get the actual thing. That’s our son’s picture above, of course—and we’ll be putting up the real thing on Sunday! Read the full post here—and Happy Thanksgiving to all!